Globally, youth unemployment is on the rise. Asia-Pacific equally faces issues with youth as well as youth-to-adult unemployment. Increasing evidence indicates that one of the main reasons for this global phenomenon is a growing mismatch between supply and demand for skills. By minimizing this gap, technical and vocational education and training (TVET) is increasingly seen as a potential means of addressing global employment challenges, slow economic growth, poverty, inequality, and the need for sustainability. Promoting TVET is thence included in the Sustainable Development Goal (SDG4)-Education 2030 Agenda, which aims to “ensure inclusive and equitable quality education and promote lifelong learning opportunities for all”. For TVET systems to fully contribute to economic, human and sustainable development, its policies and policy measures need to be well balanced, responsive to respective socio-economic contexts and closely aligned with the national economic development agenda. In this regard, UNESCO Bangkok, with support from the government of the Republic of Korea, launched the project “Developing TVET Policies Designed to Increase Skills for Employment and Entrepreneurship in Alignment with National Economic Plans.” The project aims to enhance Member States’ capacities to develop TVET policies, designed to increase skills for employment and entrepreneurship, in line with national economic development. To achieve the objectives of the project, country contexts and situations and relevant TVET policies are currently being reviewed, which will allow Member States to align their national policies with national economic plans. 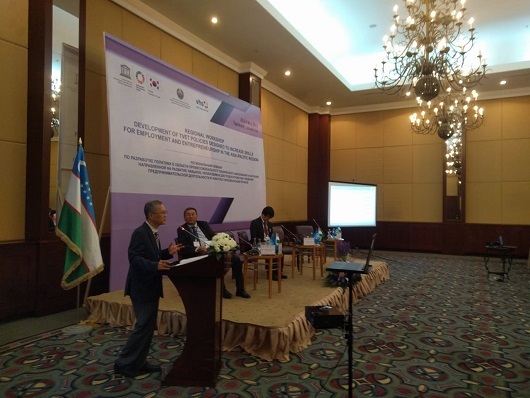 To share the major findings from the country cases, UNESCO Bangkok, UNESCO Almaty and UNESCO Tashkent, in cooperation with DVV International, is convening the “Regional Workshop on Developing TVET Policies Designed to Increase Skills for Employment and Entrepreneurship in Asia-Pacific”, in Tashkent, Uzbekistan, from May 23rd to 24th, 2018. The workshop will share selected Asia-Pacific countries’ cases (i.e., Iran, India, Kyrgyzstan, the Republic of Korea, Sri Lanka and Thailand) and discuss the issues in the Central Asian context, with focus on a lifelong learning perspective. The project will benefit from the participation of a broad range of Asia-Pacific TVET experts. Participants include policy makers and ministry officials, vocational and TVET institutions, civil society organizations, international agencies and representatives from the private sector. The event will place special focus on developing TVET policy recommendations for employment and entrepreneurship and promoting quality, inclusive learning for all. The workshop will also seek to strengthen and reinforce participants’ capacities to effectively contribute to national TVET development efforts. As the main outputs of the meeting, a synthesis report of the case studies will be produced and solid policy recommendations will be offered to Member States. These outputs aim to support Member States in developing TVET policies and action plans that can help boost employment and entrepreneurship in line with the national economic plans.